CHARLESTON -- What do you get when you combine one university, one campus ministry, seven generous churches, and 150 new college freshmen? The answer is 200 health kits and 35 flood buckets for the Midwest Mission Distribution Center. On Aug. 21, about 3,000 freshmen and transfer students at Eastern Illinois University participated in a morning of service called Jumpstart to G.I.V.E. (getting involved in volunteer efforts). The Wesley Foundation campus ministry was asked to arrange two service projects for 150 of these students. Rev. 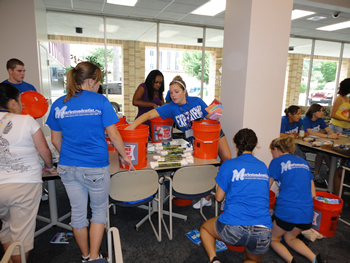 Paige Roberts, the campus minister, organized the making of health kits and flood buckets for the MMDC. This project offered a unique opportunity to share about the Wesley Foundation, MMDC, and The United Methodist Church with the freshmen, while also providing needed materials. First UMW, Kirk Chapel, Windsor, Falmouth, Paris Otterbein, Charleston Wesley, and Arcola United Methodist churches, and several individuals. On that Saturday, 150 freshmen and transfer students came into the vending lounge of the MLK Union at EIU, ready to work. Roberts first invited the students to imagine that their most precious possessions were lost, and then to imagine someone giving them a small bit of hope. Next, Mark Freeman, warehouse manager for the Midwest Mission Distribution Center, shared about the ministry of the MMDC and the many people it serves. After about an hour of “controlled chaos” (with lots of help from Mark), the kits and buckets were completed and loaded into the MMDC van. Roberts then led students in a time of reflection where they had a chance to share about the experience. Several students shared stories of people in their own lives affected by natural disasters. Some students shared about their own homes being flooded; others had family in Haiti affected by the earthquake; yet another had family in Jamaica affected by a hurricane.